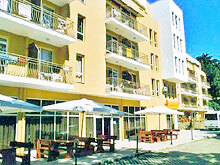 Location: Three star hotel Golden Horn is located 500 meters from the beach, near the bank, shops, convenient communications to Varna and Albena. 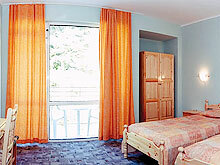 In the hotel: Type of Rooms - 112 double rooms with extra bed. Guests have at their disposal in the hotel: Restaurant, lobby bar, pool /sun beds and umbrellas - included/. The beach in Golden Sands: The beach strip in the resort - 3.5 km., Which in places reaches 100 meters wide and is known as one of the best beaches in Europe. It is flat, covered with golden sand. Sandy sea bottom gently slopes into the sea, there are no rocks or sudden bottom. Clean and calm waters with low salinity lower than that of the Mediterranean Sea, and no dangerous fish and animals are suitable for bathing children and swimming. All inclusive light: full board, in times of food offered unlimited Bulgarian alcoholic and soft drinks, hot drinks and mineral water.